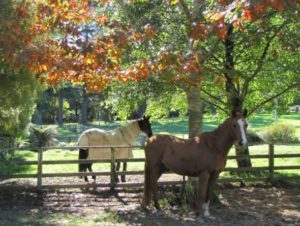 The following are just a few ideas to help create a happy and safe environment for your horses. Included are some structural design ideas along with pasture matrix blend. The concept behind these suggestions is to recreate an environment similar to what the horse in the wild would have experienced. Horses by their nature are generalist browsers covering many kilometers a day in search of a variety of nutrients. In the wild they did not exhibit permanent states of hyper vigilance, head shaking, obsessive compulsive behaviours like weaving, crib biting etc. The flight mechanism was stimulated only periodically when there was the threat of a predator starting from the sudden raising of the head, a shy and then a full bolt. So many horses today are in a state of hyper vigilance leading to adrenal and metabolic conditions making them at best a challenge to ride and at worst a dangerous riding prospect and one we no longer enjoy. Your design will consist of several elements each providing a different tier to your landscape so in effect you will be creating layers. Understory which may consist of low growing species tolerant of shade and /or climbing species. Paddock species. These will consist of a range of pasture species to include perennials, annual grasses and flowering broadleaf species. Shelter belts provide a reduction of wind velocity x 10 the height of the trees along the horizontal plane. So if your trees are 5meters high then the wind shadow will be felt as far away as 50meters from the trees. Principles of designing a shelter belt will be dealt with in a separate article. Fast maturing shelter trees include: pines (ideally I like to use pinus pinea because it is far more compact and has the added benefit of pine nuts that can be harvested. Italian alders which are nitrogen fixers.